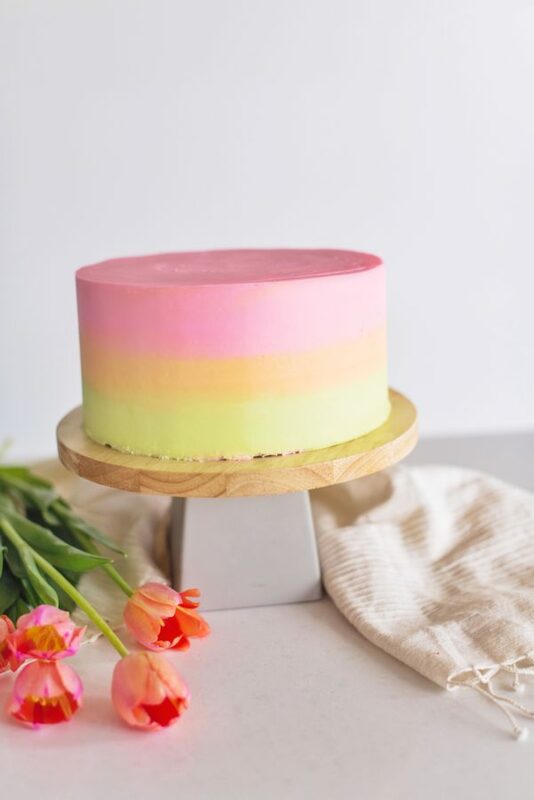 Rainbow Sherbet Cake – Tender yellow cake layers with raspberry lime curd and orange buttercream. A Classic Yellow Cake with Chocolate Frosting may be basic but it’s one of my favorites! I didn’t always love a yellow cake, though. 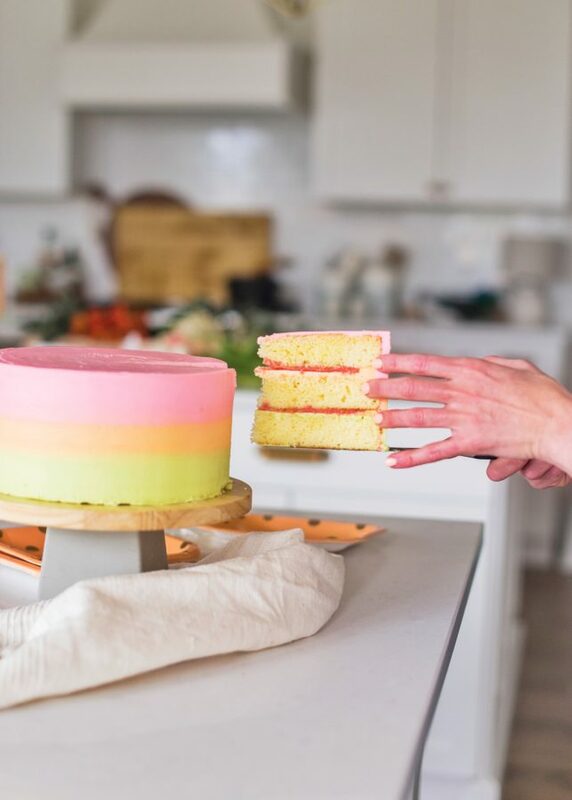 It wasn’t until I teamed up with my friend Brooke Eliason from Female Foodie a few years ago for a collaboration that I even considered making a yellow cake of my own. Yellow cake with chocolate frosting is Brooke’s favorite cake. As part of our collab, I created my own yellow cake recipe, in hopes to make it the best yellow cake she’s ever had. (And I think I did!) This yellow cake is tender, sweet and flavorful thanks to a good amount of egg yolks, sour cream, cake flour, and both clear vanilla extract and butter extract. After creating my Classic Yellow Cake, it quickly became a popular one to do in my cake classes at Orson Gygi in Salt Lake. On one occasion, I had extra layers after class. Of course, I never let cake go to waste, so I decided to incorporate the layers into a new cake. 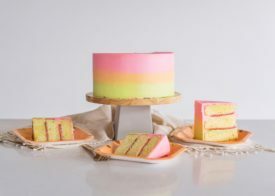 As I thought about how to use the extra yellow cake layers, I asked Westin if he wanted to help me come up with a new flavor. He jumped right in and quickly helped me decide on a raspberry lime curd for the filling. We also talked about a lime buttercream, but when we got started on the frosting, I realized I didn’t have any lime flavoring. Westin and I went through what I did have and chose orange emulsion to go in my basic vanilla buttercream. You guys! Oh. My. Gosh. The combination is out-of-this-world good. With one bite, I immediately thought of the rainbow sherbet I used to get as a kid at Baskin Robbins and it made me smile ear to ear. I’m beyond thrilled with how this cake turned out. 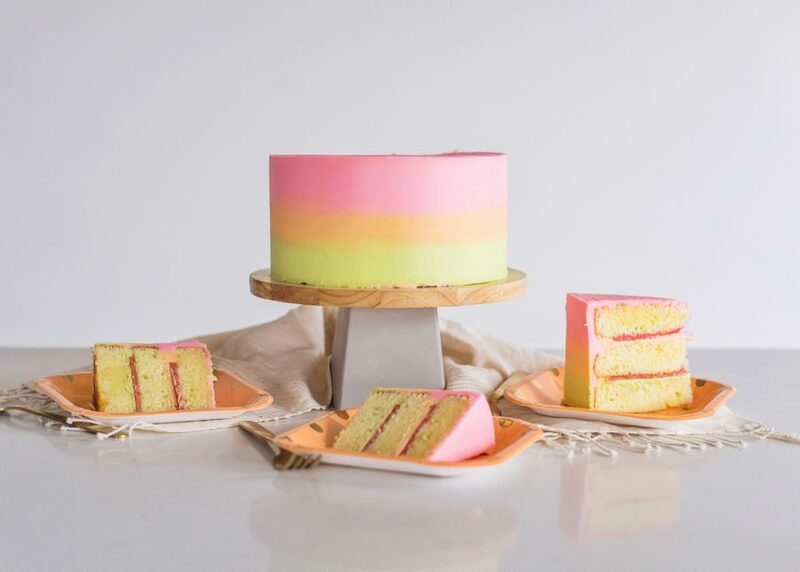 As for decorating this cake, I wanted to mimic the ice cream we all know and love. I used pink, electric green and orange food gels from Americolor. Always put frosting between the curd and the cake layer so the curd doesn’t seep into the cake. You want distinct layers. Pipe a rim of frosting around the edge of the cake to create a barrier around the filling. This will ensure your filling doesn’t ooze out the sides as you stack more cake layers on top. The rim of frosting also helps support the next cake layer. Don’t overfill your cake with the soft filling. Putting too much filling in between the layers will cause it to slide around, even with that frosting border. Instead, add just enough for a thin layer and then save the rest of the filling to scoop onto the plate as you serve each slice of cake. Hope you love this cake as much as I do! 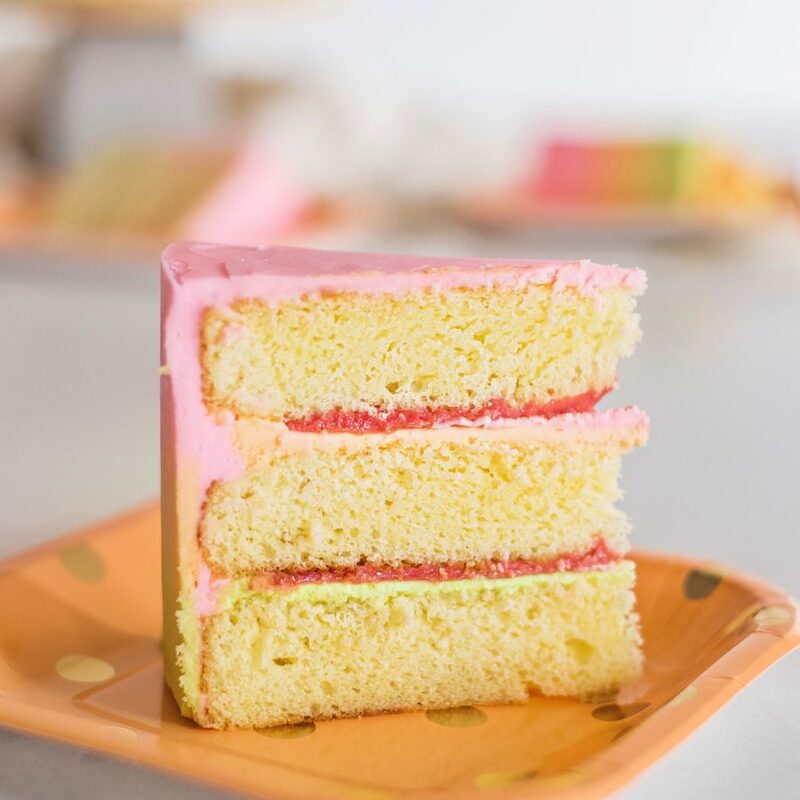 Tender yellow cake layers with raspberry lime curd and orange buttercream. Preheat your oven to 350 degrees F. Spray three 8-inch round cake pans with non-stick spray, line the bottom of each pan with parchment paper and spray again. Set aside. In a medium size bowl, stir together the cake flour, salt and baking powder. Set aside. In the bowl of a stand mixer fitted with the paddle attachment, beat the butter, canola oil, and sugar on high until light and fluffy, about 5 minutes. Add the eggs and egg yolks, one at a time to the bowl and beat on medium until well incorporated. Turn the mixer on low and add half of the flour mixture to the butter mixture until fully incorporated. Then the sour cream and blend well. Finish by adding the remaining flour mixture and mix until combined. Add the clear vanilla extract and butter extract and beat on low until incorporated. Scrape down the sides of the bowl and mix on low for another 30 seconds. Evenly distribute the cake batter among the three pans and bake for about 23-28 minutes or until a toothpick inserted into the middle of the cakes comes out with just a few moist crumbs. Remove cakes from the oven and let cool in pans for 10 minutes before inverting onto cooling racks to cool completely. Puree the raspberries and lime juice in a blender. Strain the mixture through a fine-mesh sieve into a medium saucepan, pushing it through with a rubber spatula. Rinse the sieve - you'll be using it again. Whisk the sugar, cornstarch, lime zest, and salt into the raspberry puree. Whisk in the egg yolk. Cook the mixture over medium heat, whisking constantly, until it's thick like pudding, about 5 to 7 minutes. Remove from heat and whisk in the butter a few pieces at a time until incorporated. Strain the mixture through the sieve into a small bowl, pushing it through with rubber spatula. Press plastic wrap directly onto the surface to prevent a skin from forming. Refrigerate until completely set, at least 4 hours and up to 5 days. Turn the mixer to low and gradually add the powdered sugar, followed by the cream, salt and orange emulsion. Mix until combined. Add food gel, if using. Mix until incorporated completely. Turn the mixer to medium-high and beat the frosting for about 5 minutes. Spread a thin layer of frosting over the cake layer and pipe a rim of frosting around the edge of the cake to create a barrier to the filling. Spread about 1/3 cup of the curd in the center of the cake, carefully spreading it to the edge of the piping. Place a second cake layer on top of the piped frosting and filling and repeat step 2. Place the final cake layer, top side down, on the second layer of filling. Hi Courtney! I love your cakes & look at your perfection of an Instragram daily. 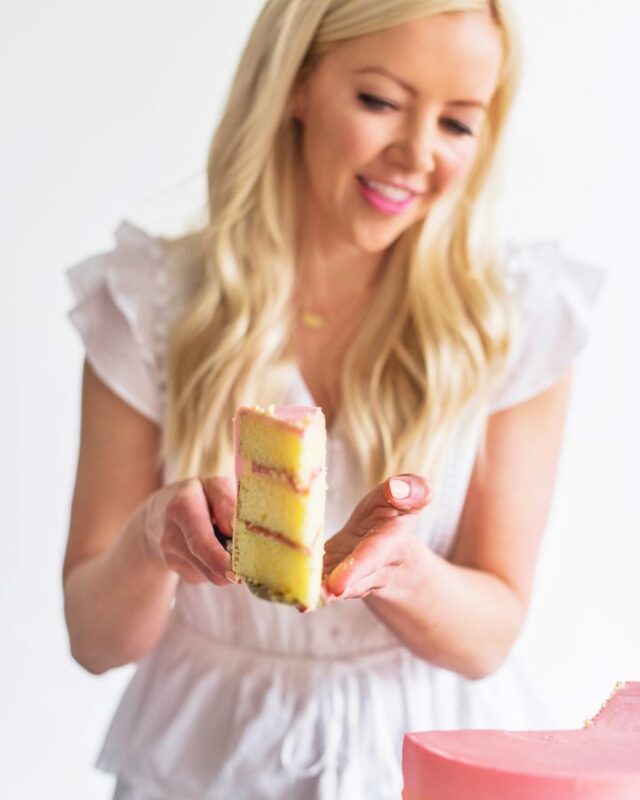 I am currently looking for the perfect recipes to make a vanilla cake with lemon curd and vanilla buttercream layers this week. Would this yellow cake recipe work for that? Want to make sure I pick something nice and light/fluffy so it’s not too dense with the lemon. Thanks so much!! 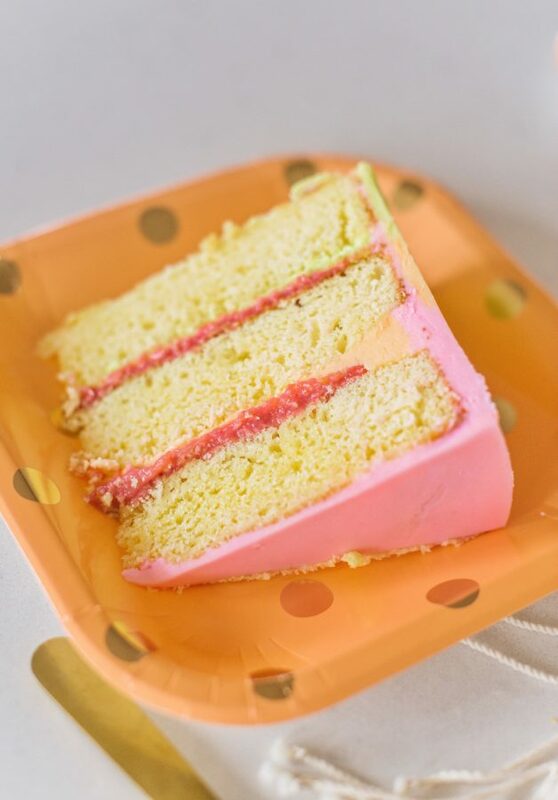 I actually think my Lemon Poppyseed Cake without the poppyseeds or my white cake from my funfetti cake would be best with lemon curd and vanilla buttercream. This cake looks delicious. I’m wanting to try the raspberry lemon curd. Can I use frozen raspberries instead of fresh? Thanks!